Following his electoral victory in November 1980, President Ronald Reagan amplified the concerns expressed by President Carter and Congress about foreign support of Central American leftist guerrilla forces. In February 1981, a month after the leftist Farabundo Martí National Liberation Front (FMLN) launched a major offensive against the Salvadoran military, the Department of State issued a White Paper stating that Cuba and other Communist countries had played a central role in the political unification, military direction, and arming of the Salvadoran insurgents. Secretary of State Alexander Haig accused the Sandinista government of exporting terrorism to El Salvador and in April 1981, Reagan terminated economic assistance to Nicaragua citing its involvement in supporting Salvadoran rebels. After several failed diplomatic attempts to dissuade Managua from supporting FMLN activities, Reagan opted to support a clandestine guerrilla force to quash the Sandinista training and arming of Salvadoran guerillas. These “Contras,” as in “counterrevolutionaries,” were primarily ex-Nicaraguan National Guard members who had gathered in Honduran territory. The Contras launched their first major attack against the Sandinistas in March 1982. In response, the Sandinistas undertook a dramatic build-up of military manpower assisted by Soviet and Cuban advisers and weaponry, mostly from the Soviet bloc. Reagan’s efforts to strengthen the Contras met with opposition from a divided Congress and resistance in Nicaragua. Concerns about the ultimate goals of the Contras and the possibility of direct U.S. military involvement prompted Representative Edward Boland, Chairman of the House Intelligence Committee, to sponsor legislation in December 1982 that prohibited the use of U.S. funds for the purpose of overthrowing the Sandinista government. The bill, signed into law by Reagan later that December, allowed assistance to the Contras for other purposes. Reagan continued to advocate increases in support for the Contras. He addressed a joint session of Congress in April 1983 asserting that the Sandinista government presented a threat to Central America and U.S. national security. American military exercises off the Nicaraguan coast and the invasion of Grenada in October 1983 demonstrated Reagan’s commitment to countering Communist threats in the region. Consequently, the Sandinistas decided to participate in the Contadora peace negotiations that had begun in January 1983 at the initiative of Mexico, Venezuela, Colombia, and Panama. Claiming success in rolling back Communism in Grenada, Reagan gained congressional increases of up to $100 million in non-military aid to the Contras. In October 1984, however, Congress ended the support after learning about the mining of Nicaraguan harbors and the destruction of an oil facility. In November 1984 Reagan’s re-election and Sandinista leader Daniel Ortega’s elevation to president in a controversial national election set the tone for additional confrontation. Reagan redoubled his commitment to the Contras in his second term. In his 1985 State of the Union address he called them “freedom-fighters” who were risking their lives to “defy Soviet-supported aggression.” In June 1985 Congress agreed to $27 million in humanitarian aid for the Contras, but no military support. Sandinista victories against the Contra fighters, heavy Presidential lobbying, and an incursion into Honduran territory by Nicaraguan forces helped to sway Congress into approving $100 million for the Contras, with seventy percent allocated for military aid to be delivered in October 1986. However, the Iran-Contra scandal broke the next month. The Tower Commission reported that White House staff members had been using extralegal funds raised from arms sales to Iran and foreign donors to arm the Contras prior to October 1986. Following the deaths of hundreds of thousands and a decade of economic devastation, peace initiatives eventually gained traction in Central America. Numerous efforts to establish a peace plan by regional leaders, the United Nations, and the Organization of American States had continued in the wake of the 1983 Contadora initiative. In August 1987, Central American leaders signed a peace accord at Esquipulas, Guatemala that had been shaped and promoted primarily by Costa Rican President Óscar Arias. The plan focused on democratization and regional security, backed with a system of verification. Meeting in Costa Rica in January 1988, Central American leaders cemented their commitment to implement the Guatemala peace accord. Nicaraguan President Ortega entered into negotiations with the Contras and the United States began to shift aid to humanitarian purposes. Nicaragua implemented the accord and held internationally supervised elections in 1990. Violeta Chamorro, former member of the revolutionary Provisional Government and widow of Pedro Joaquín Chamorro, the journalist and hero of the opposition who had been slain in 1978, was elected president and the Contras disbanded. The civil war in El Salvador lasted until 1991, when the FMLN reached a peace accord with the Salvadoran Government under United Nations supervision. In Guatemala, fighting between leftist groups and the military continued into the mid-1990s. Washington continued to perceive threats in Central America after the end of the Cold War. On December 20, 1989, President George H.W. Bush dispatched over twenty thousand troops to invade Panama and arrest its head of state, Manuel Noriega. Noriega had nullified a presidential election won by opposition candidate Guillermo Endara that May. 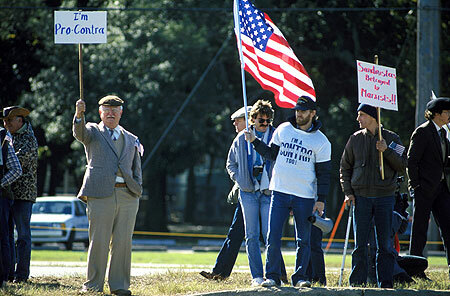 In addition, Bush had become opposed to Noriega's continued leadership of Panama due to Noriega’s connections with drug smuggling and money laundering, as well as the declining security situation around the Panama Canal. In the months leading up to the invasion, the Bush administration implemented economic sanctions and increased local troop levels. The Panamanian legislature declared that a state of war existed with the United States on December 15 due to the escalating tension between the two countries. A U.S. serviceman was killed in Panama the following day; this and other events, including the harassment of a U.S. officer and his wife, precipitated U.S. action. Code-named Operation Just Cause, the fighting lasted for five days. After taking refuge in the Vatican Embassy, Noriega eventually surrendered to U.S. authorities and Endara regained his presidency. Noriega was tried in a United States court and convicted on charges of drug trafficking, money laundering, and racketeering.